Do you struggle to convince management of the value of its FM organization? Many FMs do and if they indexed their overall performance, they would be able to show management that their approach is appropriate. Indexing allows FMs and CREs to see how their portfolio compares with others at a macro level, without the need to benchmark each building. This is the way that executives like to see facilities data. Indexing is considerably different and easier than traditional benchmarking. Chart notes: Each company in the Facility Benchmark Index is represented by a different bar. In this example, Your Company (yellow bar) is in Quartile Two. This chart is for buildings greater than 600,000 sq. ft., older than 21 years with the primary use as office. 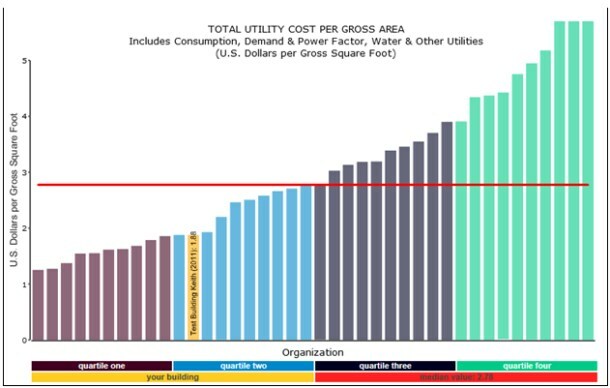 The difference between your company and the median company is $0.90 per SF, the graph enables you to show management that you are saving at least $540,000 per year in utilities costs over the median building (600,000 SF x $0.90/SF). Note to outsourcing companies: Indexes can also work well for outsourcing companies. Data summarizing all clients can be input into the Index. Let’s say that the Index for the outsourcing company yielded a similar chart to what is above, and that your outsourcing company managed 100 buildings of 600,000 sq. ft. or more. Then your company can demonstrate that it has saved its clients in large buildings ($540,000) x (100) = $54 million dollars a year. That is a large number! Outsourcing companies can also track their client companies separately so that they can be compared and determine which ones are holding their performance down. Most companies have that data readily available, so participating in the Index should not consume more than few minutes of company time—much less than inputting data from individual buildings. Improve your Business Development opportunities. You will be able to support with Index charts the marketing claims that you are best in class. You can also use indexing to support the development of additional projects to obtain first quartile performance. Justify pricing to clients. All organizations have a need to support or prove that that their costs are reasonable. By indexing you can show your results directly and may even avoid having to re-bid a project. This has been used successfully with several of clients to avoid re-bidding. Provide evidence-based justification and support that will result in C-Suite support for FM budget. Improve performance where your metrics are not as strong as you’d like them to be. For example, you may be a top performer on all metrics but one; indexing will identify that metric for you, and then you can figure out what you will have to do to improve performance there, if you want to do so. Indexes are easy to find the necessary data to populate the index. They generate reports that are easily understandable and wanted by executives outside of the facilities and CRE organizations. They show at a glance where you are outshining others, and justify where you will need to spend to improve your portfolio performance. If your building portfolio performance is under par for one area (e.g., maintenance), you don’t need to delve into more detail for other aspects of your operations—just maintenance. If nothing obvious stands out as to why your maintenance costs are high, you can look at which of your buildings are bring up the maintenance costs. You then can look at them in more detail. At that point, benchmarking individual buildings may make the most sense. Present a macro-level summary to the C-Suite. Identify which buildings are under-performing. Identify what can be done to improve the under-performing buildings.